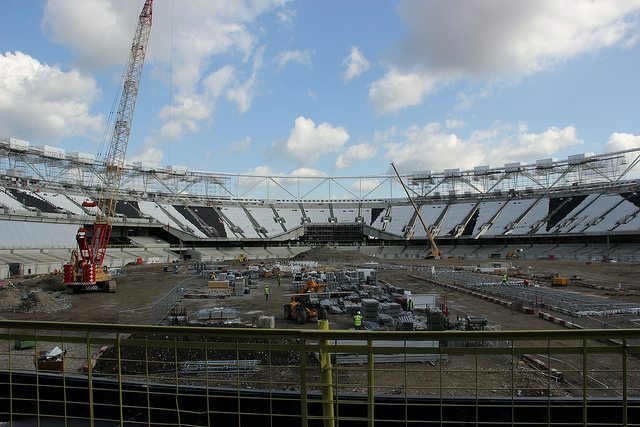 In January 2014 Balfour Beatty announced they had been awarded a £154m contract by London Legacy to transform the former Queen Elizabeth Olympic Stadium at Queen Elizabeth Olympic Park in London into a ‘multi use venue’ which after hosting five matches for the Rugby World Cup in 2015 will become the full time home for West Ham United in 2016. 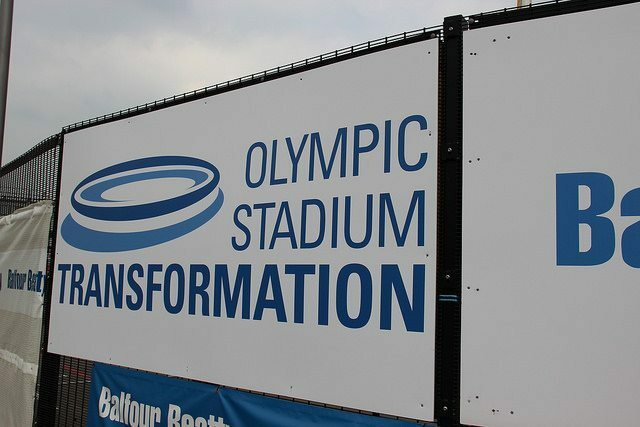 Part of this project involved a £41m reconfiguration and expansion of the stadium roof. 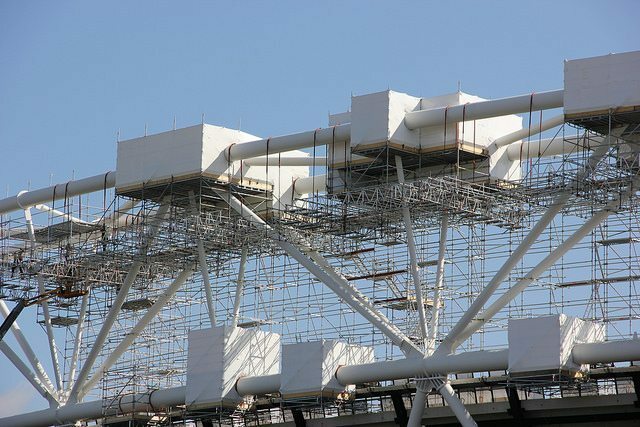 This work, once complete, will increase the roof weight from 1400 tonnes to 4000 tonnes and create the largest cantilevered roof in the world. The project to reconfigure the roof presented a number of challenges. 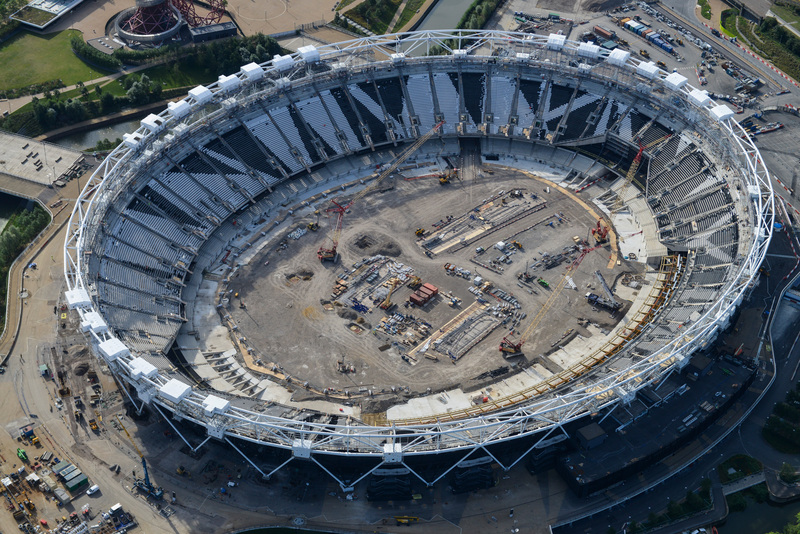 Firstly, work needed to take place on the original stadium roof’s support structure which was up to 37 metres (121 feet) above the ground. Secondly, a time schedule of 25 weeks to complete the works meant that traditional scaffolding techniques would be impractical. As a solution, rather than build from the ‘bottom up’, the scaffolding & access contractor, PHD Modular Access Ltd., implemented techniques usually used in the oil and gas industry and suspended the scaffolding structure from chains hung around the existing roof structure to build the access ‘top down’. The top down approach proved highly successful and in phase 1&2 of the project PHD Modular Access erected 480 tons of Layher Allround® lightweight scaffolding to create 168 ’workshops in the sky’ where shot blasting, welding and painting work was required to take place. Rhino Shrink Wrap were approached by PHD Modular Access to provide weather proofing and environmental containment around each ‘pod’ or ‘workshop’. Traditional scaffold sheeting, applied around the scaffolding in 2m high strips and attached with bungee cords, has gaps between sheets that make it difficult to stop shot blast residues escaping and rainwater penetrating. Furthermore, traditional reinforced sheeting can be difficult to fit tightly which can lead to flapping and ultimately detachment. Rhino proposed using a 300 micron thick Verisafe® flame retardant shrink wrap sheeting which once installed would created a continuously bonded and ‘drum tight’ skin around each pod. The shrink wrap encapsulation of each pod or workshop had two key objectives. Firstly to provide ‘environmental containment’ of shot blast and paint residues as sections of the roof support structure were shot blasted back to bare metal. Secondly, the shrink wrapped ‘pods’ would provide a completely weather proof area where new roof fixings could be welded into place. Zipped access doors installed in the shrink wrap cover each pod allowed welding and painting to take place in a controlled, almost ‘factory like’ environment. Rhino Shrink Wrap supplied 6 installers to carry out the work, split into two teams, each team led by a supervisor. Working from the inside of the platform, the shrink wrap sheeting, (supplied as a 7m wide x 15m long roll), was pulled over the module and battened at ‘ground level’ to a plywood floor laid inside the pod. Excess shrink wrap was trimmed at the corners and any joins or overlaps were heat welded together to create a seal. Finally, the shrink wrap sheeting was heat shrunk ‘drum tight’. Each pod required 100 to 200 square metres of shrink wrap sheeting. Sheeting cut and sealed around protrusions (like roof trusses) whilst maintaining containment. Versatile – can be cut and resealed for crane access and remain weather tight. Zipped access doors maintain factory like environment. Quick to remove after use & 100% recyclable. Welding contractors required new roof components to be welded to the existing roof structure. These needed to be craned into position, inside the sheeted area, after the area had been shot blasted. However, the Rhino team were able to cut an opening in the roof (or on the lower and smaller pods – the sides) to allow the components to be craned through and then seal back up by taping and welding. Working simultaneously on multiple locations within a large construction site was challenging. Our teams met each morning for a briefing so that every team member knew what they were doing and working time was maximised. There were changes in the schedule of work from the client which required us to be highly flexible in our approach. Where necessary our teams worked weekends to meet revised schedules. The scaffolding and encapsulation of the 168 ‘workshops in the sky’ was finished ahead of schedule. Although a very challenging 3 month project, with much time away from home, our teams learned the importance of effective communication for safety and efficiency on large sites and were proud to play a small part in making this exciting and innovative project a success.